Nutrient pollution caused by excess phosphorus in our waterways has impaired seas, oceans and waterways on every continent. Eutrophication caused by these excess nutrients destroys aquatic life and has contributed to the more than 400 dead zones worldwide. Regulators around the globe have imposed discharge limits for nutrients on wastewater treatment plants for many decades; and, these limits are becoming more widespread and stringent to restore the health of eutrophied water bodies. Thames Water new environmental facility in Slough is officially opened by author and environmentalist Tony Juniper, Wednesday 06 November 2013. The flagship facility strips phosphorus from waste water and converts it into commercial slow-release fertiliser. Paradoxically, the application of phosphorus to agriculture is essential to grow the world’s food supply. However, phosphorus fertilisers are water soluble, leading to high levels of leaching and tie-up in the soil, further contributing to the environmental challenge. Ostara was formed in 2005 to commercialise technology for phosphorus recovery. Today, Ostara is considered the industry leader with 17 plants commercially operating in North America in Europe. Ostara’s technology helps wastewater treatment plants to recover phosphorus, enabling them to comply with discharge limits more cost effectively whilst delivering a range of additional operational benefits across the plant. Importantly, Ostara’s process creates a finished fertiliser product – not a raw material – which can be directly substituted in the place of conventional mineral fertilisers. 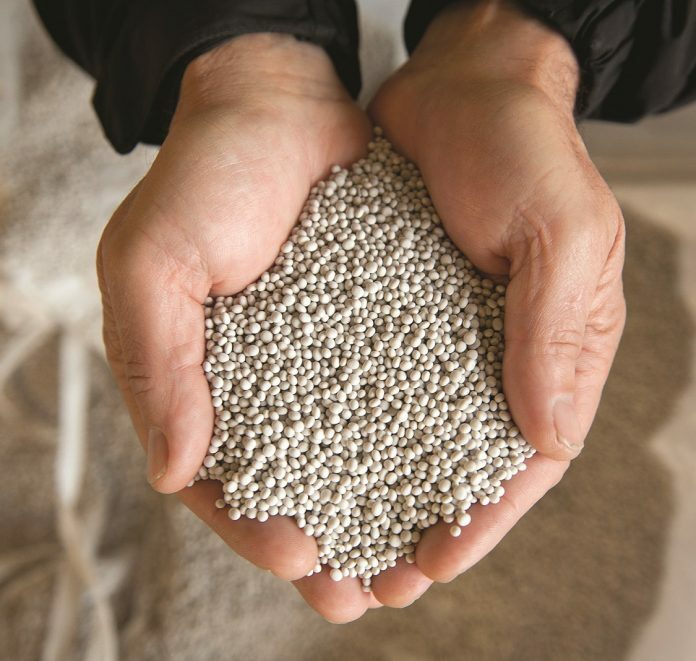 This finished product – a pure form of struvite, branded as Crystal Green – meets the needs of the agriculture, turf and horticulture industries which are hungry for a high-performing phosphorus fertiliser. Crystal Green is Root Activated™, meaning it only releases nutrients in accordance with the release of organic acids exuded by growing roots of a plant. Unlike conventional phosphorus fertilisers, which are water soluble, the phosphorus take-up by the plant is increased, and leaching, run-off and tie-up in the soil are significantly reduced. Ostara has long recognised that to deliver a truly circular approach to phosphorus recovery the needs of each stakeholder must be met. As such, it is not only the purity and consistency of Crystal Green that makes it attractive; but the physical form ensures that it is ready to be used in fertiliser blends and applied using common agriculture equipment. Commercial model also plays a key role. Ostara buys back the fertiliser produced by plants utilising its technology – providing a guaranteed revenue stream for wastewater treatment plant operators and allowing production volumes to be aggregated to meet the volume demands of the fertiliser supply chain and end users. By responding to the needs of the market, and initially working with growers to complete more than 170 trials (both replicated small plot and field) completed on a variety of crops across North America and Europe, Ostara has successfully gained market adoption for Crystal Green. Through these trials and the experience of farmers and growers, Crystal Green has been demonstrated to have shown significant yield increases at the time of harvest which has resulted in a positive return on investment for farmers. Nevertheless, there are commercialisation challenges. While Crystal Green is designated as an EC fertiliser, the fact that it has been recovered from wastewater means it must meet end-of-waste criteria under Article 28 of the EU Waste Directive. The absence of EU-wide criteria and the lack of mutual recognition between member states creates a disproportionate regulatory hurdle for recovered nutrients when compared to virgin materials. The new EU fertiliser regulations, expected in late 2018, are a key element of the EU’s circular economy package and will create a level playing field for recovered nutrients, thus boosting the market for these products. Ostara’s facilities have a combined capacity to produce up to 17,000 tonnes per annum of Crystal Green fertiliser. Over the last two years all fertiliser produced has been sold commercially to Ostara’s network of blenders and distributors, who in turn are selling to growers in the turf and agriculture sectors – validating the demand for high quality, recovered nutrients.